The CHC initiated its work in 1994 with a pilot project in Svay Rieng, a rural province bordering Vietnam that continues to have one of the highest TB rates in the country and the world. Subsistence agriculture is the primary source of income for most of Svay Rieng's residents. Because of the poor soil quality and decades of war, Svay Rieng was and remains one of Cambodia's poorest provinces. The CHC TB program pioneered a community-based, patient-centered approach to the treatment of TB. The Svay Rieng project, based in local district hospitals, combined Community Treatment Model with CHC innovations such as the use of patient supporters, treatment contracts, and nutritional support. Some patients received home delivery of medicines from mobile teams of health workers. Poverty reduction strategies were an integral pat of the program, which linked microcredit and village bank programs to TB education and treatment. In 1997, CHC expanded its program to the province of Kompot, a former stronghold of the Khmer Rouge. The CHC's efforts began just a few months after the Khmer Rouge put down its guns in its long-standing civil war with the Cambodian government. CHC rapidly scaled up care for TB using its signature approaches of community health workers, patient supporters, food, treatment contracts, and training. At the same time, the organization began to build a village network with village bank and HIV prevention activities. From this initial pilot project in three district hospitals of Svay Rieng Province in 1994, CHC has progressively scaled up comprehensive TB care to include more and more Cambodians and has reached more than 38,000 TB patients. Currently, CHC TB treatment and TB/HIV screening programs cover Svay Rieng, Kompot and the whole of Kandal province, which surrounds the capital city of Phnom Penh. The total area of activity embraces a population of 1,242,507, which includes 90 health centers and 1083 villages. Starting in 1997, the CHC provided HIV/AIDS education and prevention programs in Svay Rieng and Kompot, and in 2004 building upon the TB infrastructure, CHC initiated one of the first AIDS treatment programs in the country with the establishment of an AIDS clinic at the Svay Rieng Provincial Hospital at the Svay Rieng Provincial Hospital, pioneering integrated TB and HIV care. 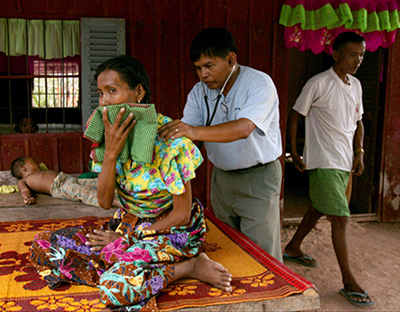 In 2005, the CHC began the first district-level AIDS treatment program in the Kompong Trach district of Kompot. Today, the CHC oversees rural AIDS programs in both Kompot and Svay Rieng, providing almost 5,000 children and adults with AIDS care. CHC activities in rural Cambodia have strengthened the capacity of the National Tuberculosis Program and the National AIDS Program, and have built strong community and organizational links to educate, prevent and treat both diseases. The CHC has also sought to incorporate basic research into its efforts, in partnership with labs at Harvard Medical School, which offer the most sophisticated molecular and immunological approaches available to study disease. With its approach of linking community-based care to the best in scientific discovery and treating patients as partners, the CHC strives to learn lessons that will lead to future treatments, vaccines and cures. The CHC believes that its success in joining TB and AIDS discovery and care with access to drugs and poverty reduction programs provides a powerful example of moving towards a cure of these diseases while delivering the human right of access to care for all who need it.